Our stainless steel dosing pots at Flowmech are designed to provide a simple and economical solution for the introduction of chemicals- such as cleaning agents, anti-freeze and corrosion inhibitors- to both heating and chilled water systems. What are chemical dosing pots? Dosing pots are a must-have if you need to introduce liquid chemicals into your heating or chilled water system. Here at Flowmech, our dosing pots are sized in accordance with your heating or chilled water system- guaranteeing a perfect fit. They are made up of a stainless steel vessel and have an inlet and outlet valve, as well as a drain valve and a filling valve. If dosing pots are installed correctly, they should reduce energy costs and increase efficiency, whilst improving the life of the system at the same time. How does chemical dosing work? The chemical dosing pot is fitted across flow and return lines within the pipework. It allows system water to be drained and, once the system is reconnected, the chemicals can be flushed through. When it comes to choosing a chemical dosing pot, we supply a wide range of products that are carefully manufactured to operate effectively. To ensure optimal efficiency, it’s vital that you install the chemical dosing pot correctly. If you require assistance with this, please get in touch with us. Isolate the heating/chilled system by closing all of the valves. Drain the unit by opening the drain valve and the fill valve. Fill the unit with chemicals – to do this you’ll need to close the drain valve and add the dosing chemicals. Open the air vent to vent the unit until the air has been removed and then close all of the vents. Open the inlet and outlet valves carefully to dose the unit and once you have finished, close all of the valves. How can you benefit from chemical dosing? 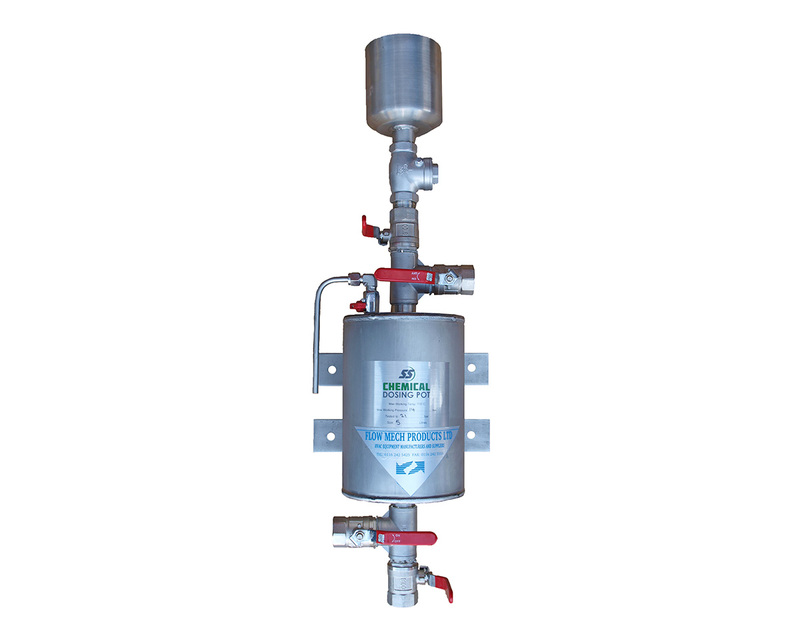 Chemical dosing is a controlled means for dosing chemicals into heating or chilled systems. Not only is it considered to be less disruptive to the operation of the heating or chilled water system, but it’s also easy to maintain. In supplying the chemical dosing pot, we can facilitate the regular maintenance of systems, allowing you to keep them clean and functioning efficiently, ultimately prolonging service life. To make it safer for you, any chemical dosing pot that we provide at Flowmech incorporates an integral safety non-return valve. This prevents fluids from escaping under extreme pressure. Chemical dosing is seen to be a cost-effective way of controlling the method of dosing chemicals into a heating or chilled water system. We stock the chemical dosing pots in standard volume sizes, including 5, 10 and 15 Litres. For more information about chemical dosing and our range of stock, don’t hesitate to contact the technical experts at Flowmech by calling 0116 242 5425 or emailing us at info@flowmech.co.uk today.